In particular, I wondered what digital goodies we've released from Steve Jackson Games that weren't tied to GURPS. It was clearly a busy year, and I'd forgotten how many other gems we unearthed for our electron emporium. Fans of In Nomine had lots to celebrate last year, with nine classic offerings for that line. We digitized the entire Revelations Cycle, with action on the Corporeal, Ethereal, and Celestial Realms, plus a perplexing penultimate part and a suitably cinematic conclusion). We also released not one, not two, but three installments of the Superiors line. 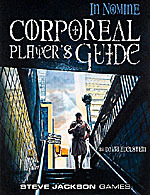 Last but not least, we uploaded the Corporeal Player's Guide, which is currently the best-selling of last year's crops (although since it came out in March, it had more time than its 2011 siblings). Also in 2011, fans of violent driving mayhem who didn't want to travel to mall parking lots could instead buy several Car Wars classics for their collections. 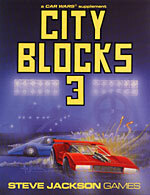 We released two installments of City Blocks printable arenas (one a two-dimensional treat and the other a 3-D threat). We also uploaded The AADA Vehicle Guide Volume 2 (plus its counters) and The AADA Vehicle Guide Volume 3. Drive offensively! Longtime gaming-world hobbyists were no doubt thrilled by the fact we finished archiving all issues of Space Gamer from the Steve Jackson Games vaults. There are too many to give a shout-out to individually (24 issues total! 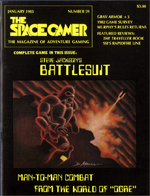 ), but the bestsellers were Space Gamer #59 (I'm guessing for the "Battlesuit" rules for Ogre), Space Gamer #55 (with the Necromancer game insert), and Space Gamer #66 (which had two complete science-fiction games!). If you're a fan of old-school awesomeness, you owe it to yourself to give Space Gamer a shot . . .
. . . Unless your tastes run toward the more fantastic. In 2011, we also uploaded all six issues of Fantasy Gamer from our pearlescent past. It looks like the most popular here were Fantasy Gamer #3 (probably for the solo adventure designed for Call of Cthulhu), Fantasy Gamer #1 (which came with the "Slasher Flick" game), and Fantasy Gamer #5 (complete with the game "Demonwand" designed by someone named "Steve Jackson" . . .). 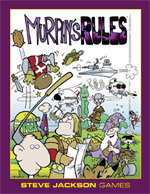 For fans of funny figures, we also digitized the out-of-print compilation of Murphy's Rules. This comic collection proves that when you attempt to codify the world, hilarity ensues. Finally, frugal aficionados found a couple of freebies last year, including Floor Plan 2: The Great Salt Flats (our funny-but-functional April Fool's offering) and Epic Munchkin (which we revised and uploaded last January). In all, by my math, we posted 47 publications from Steve Jackson Games that aren't related to GURPS. It's no wonder my iPad is always so pleasantly stuffed with gaming goodness!